Do you have any questions? We will help you! Our expert Debra Garls is happy to answer your questions! 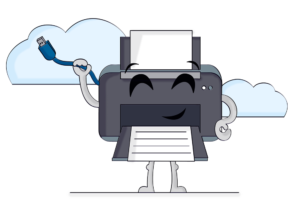 Cloud Printing makes your printing processes flexible, cost-effective and easy. And, with SEAL Systems, it is even hardware independent. Does the elimination of in-house-operation also work in a field, where still own hardware is needed, especially with printing? Corporate Output Management as a SaaS service from the cloud – is this possible? Thousands of print jobs each day, which are being sent back and forth between location and cloud, impacting the WAN? How can be data security and data protection be guaranteed? How does data get to the device finally? Is it possible, to develop a solution, which enables output management in a seamless mix and merge between cloud service and in-house-operation, beginning with complete installation on premises up to serverless printing from the public cloud? To all questions…Yes! It definitely works! The first step for optimizing your print processes may be the establishment of different application layers – and provide these as necessary services. The main focus of this approach lays on the pure print output and simplification of administration. With the generic printer driver SEAL Master Driver from SEAL Systems, you minimize the driver variety on your client systems (Windows 32/64 Bit, Citrix, Terminal servers). This avoids rollout costs and worries caused by driver conflicts. Send an email with attachment to a specific email address. From the contents, a print job is generated and sent for example to a follow-me or pick-up queue for a certain device. There, the print result is waiting for your response for output. Our Mobile Printing App enables you to start print jobs from every smartphone and output them directly to any printer. In addition, you can manage all your print jobs in the app. Cloud printing has many advantages! … doesn’t need its own infrastructure. You can easily book all necessary services as managed services. 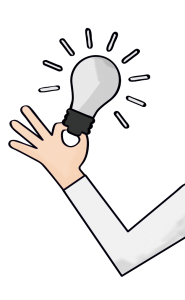 … can be easily tied in with your current application landscape. 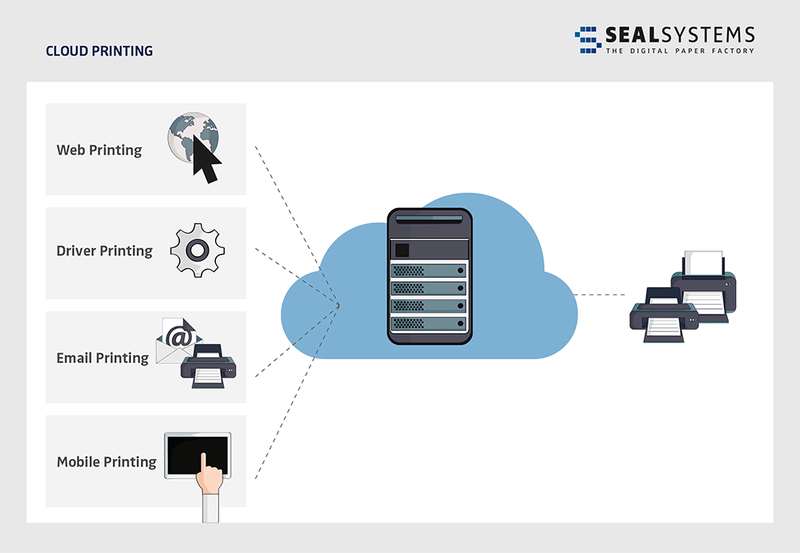 Whether SAP, Mainframe or Windows, the connection is done over SEAL Systems’ proven integration components. Print 100,000 pages today and 500 tomorrow without additional hardware. Pay for only what you use. … also works easily across multiple locations. Print without additional infrastructure from different locations, and (of course) from your smartphone or tablet. … can be easily expanded. you can expand your cloud installations quickly and easily for special services like stamps and watermarks. The connection to other cloud services is also no problem. Our cloud products protect your valuable data from source to printing with state-of-the-art security technology. So that your print orders come out where you want it to. Besides the optimization of the printing processes you can include additional systems and applications. This enables an integration of all business processes and workflows. You can connect many output and distribution channels. We call this holistic approach Corporate Output Management – and it also runs in the cloud! Which accounting and delivery types are available for the Cloud? There are many different applications running in the cloud as a consequence of the wide-spread outsourcing strategy. Therefore, the hosters offer different cloud technologies, accounting and delivery models. Each of these types has advantages and special restrictions. Because of their scaling possibilities, cloud applications can provide and process big data within a short time. At the end of these processes, there is always a need for the distribution of information or documents – which can be done as paper or electronically. The processing can be completed automatically and embedded in the business process, or with an interactive operation. *No newsletter, no forwarding, contact by email only for the purpose mentio. *No newsletter, no forwarding, contact by email only for the purpose mentioned.